FreedomPop is already a solid choice for adding a small amount of service to an unused phone, but now the FreedomPop online store also includes LTE versions of both the Galaxy Tab 3 7.0 and the iPad mini. We don't particularly care about the latter (did you read the sign on the door? ), but the Samsung tablet costs $199.99 at its promotional price, though the tiny type says it's a refurbished device. 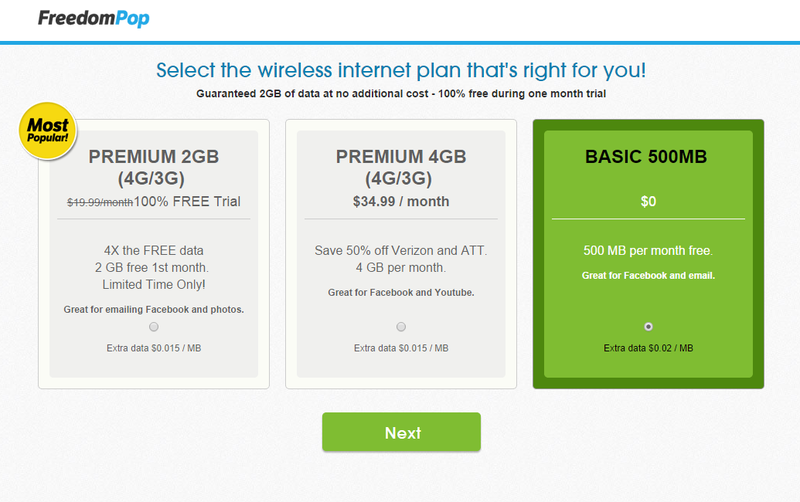 It's eligible for FreedomPop's free 500MB data plan. Interestingly, that plan also includes the standard FreedomPop 200 minutes of free cell service and 500 text messages, despite the fact that LTE tablets usually come to American carriers with voice calling and texting capability disabled. Galaxy Tab 3 owners as well as anyone who brings their own 3G/LTE tablet to the service will need to use the FreedomPop Voice and Text app to access phone calls and text messages. Since that's basically a VOIP system, keep in mind that making calls when you're outside a Wi-Fi network will probably eat into both your voice minutes and data allotment. Tablets can access the same conventional plans as phones, and will have to pay the same overage fees if they want more data. Also, there are some unfortunate conditions that FreedomPop isn't in any hurry to highlight. FreedomPop is a Sprint MVNO, which means that you only get data on Sprint's network (easily the smallest of the Big Four in the US). It also means that you can only bring certain Sprint phones to the "BYOD" service. Presumably that applies to tablets as well, though that point isn't immediately clear - I'd get more accurate information for this report, but FreedomPop doesn't appear to employ humans for technical support. (Answer your phones, jerks!) If the tablet devices are limited to current and former Sprint tablets, that will mean you can only choose between a few iPad and Galaxy Tab models, as well as a few oddballs like the ZTE Optik 2. LOS ANGELES, CA – July 30, 2014 – FreedomPop – the free mobile service company offering free voice, text and data – today announced that it is now offering discounted LTE tablets with free data plus expanding tablet functionality to include phone capabilities: a unique phone number, voice and texting. Specifically, users will be able to associate a unique phone number with any FreedomPop tablet and make free calls and texts. This functionality does not currently exist for tablets offered by large carriers, partially because of the potential to cannibalize high margin phone plans. At issue for many has been the cost of adding data to a second device like a tablet. Less than 70 percent of new tablets are purchased with LTE. With FreedomPop’s new tablet and data options, consumers now have the luxury of free data plans for both phones and tablets. In addition to the popular iPad mini and Samsung Tab 3 tablets, users with existing LTE tablets can also move their existing tablets to FreedomPop and get the same 500 MBs of LTE data, 200 voice minutes and 500 texts absolutely free. 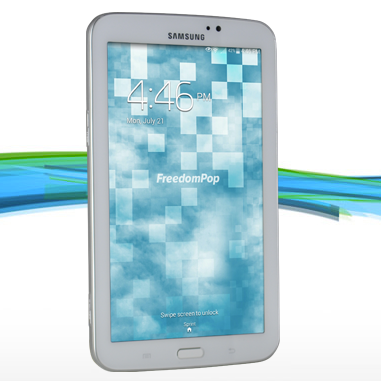 Users can bring their own iPad or Tab device or purchase one from FreedomPop. 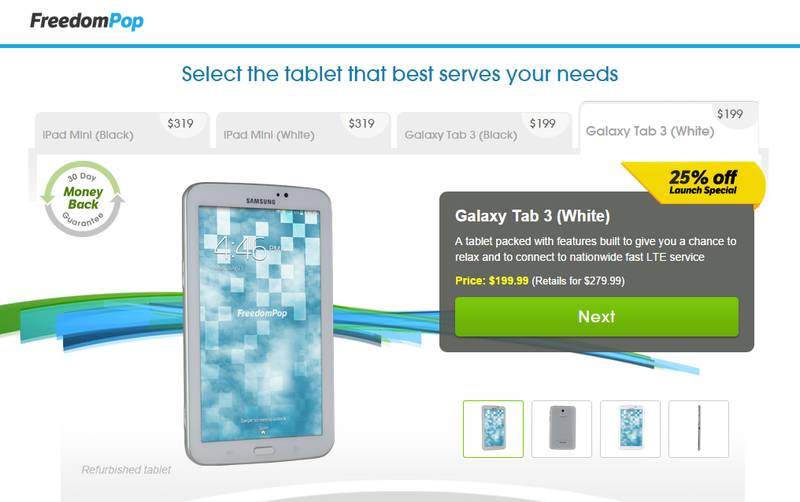 The iPad mini will sell for $319 and the Samsung Tab 3 for $199. These popular LTE tablets join the growing list of mobile phones and devices available to FreedomPop users since its launch, which include the iPhone 5, several of the top-selling Android smartphones and portable Wi-Fi hotspots. To order a smartphone or tablet from FreedomPop and to sign up for service now, go toFreedomPop.com. FreedomPop provides disruptive mobile services so that no one is left off the "connected grid." Launched in 2012, FreedomPop is rewriting the rules of the telecoms industry and is backed by Mangrove Capital, DCM and Skype Founder Niklas Zennstom's Atomico. The company offers consumers access to free high-speed Internet and mobile phone services nationwide.